"Sony full-featured workstation to produce music"
Do you want to become a musical producer? Here is an excellent alternative you can use in order to get closer to your life dream. 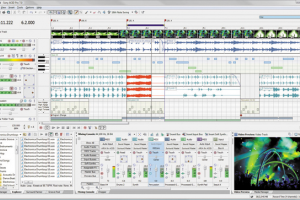 Sony ACID Pro is specially designed for musical production. This powerful Sony software possesses a complete set of efficient features for editing and composing, which will flexibly let all musical producers and musicians give free rein to their creativity. Even if you are new to music editing or a seasoned professional, you will be able to create and customize music in just a few minutes. The software´s automatic Loop time-stretching and Tempo-matching Technology can´t be easily compared. Something to highlight is its straightforward Paint, Pick and Play feature, which made Sony ACID Pro one of the best and popular Loop-Based music creation suite. Now, this software enhances its functionality even more by adding multi-track recording and Full Midi Sequencing to its looping feature. Sony ACID Pro brings a professional music workstation to you.